The Raiders actually looked feisty in the first half of their season-opener against the Rams last night. There were sparks of creativity on offense, a vintage Beast Mode touchdown, and a 13-10 halftime lead to mark head coach Jon Gruden’s return to the NFL. Everything fell apart in the second half, though, and the Raiders went on to lose the game 33-13, in no small part due to their inability to pressure Rams quarterback Jared Goff. When you can run the ball like they can in the second half it’s very hard to rush the passer. Obviously we didn’t get to Goff enough. And we didn’t get to Gurley enough. And we’ll take a good look at the reasons why we didn’t. 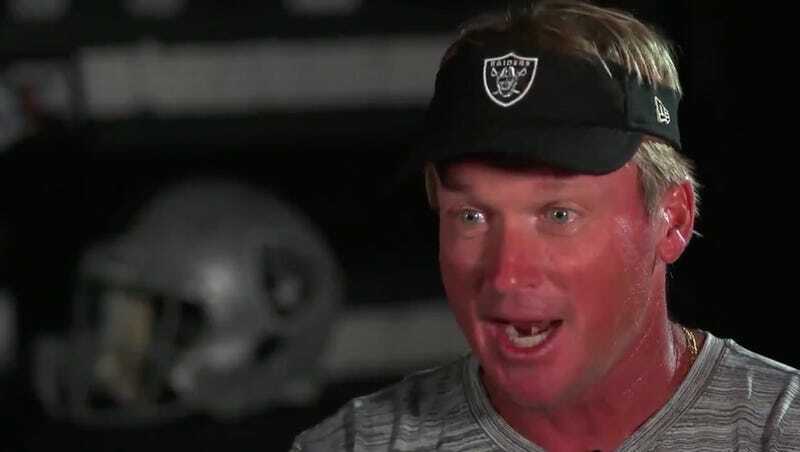 Football is a complicated game that presents no easy answers, so wish Gruden luck on his quest to figure out precisely why he went and traded away one of the best pass rushers in the NFL just a few days before the start of the season, like a big huge moron.